The Pajero Sport was launched in 2012 after a lot of waiting. 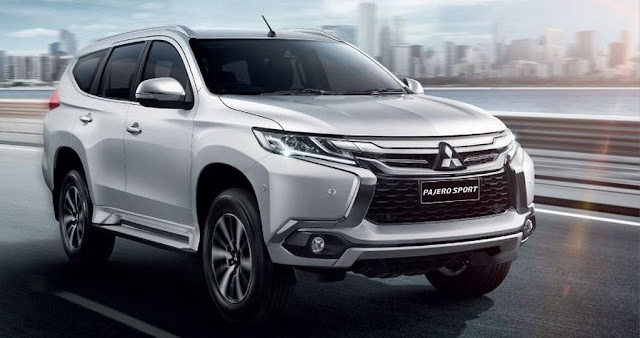 New Model Mitsubishi Pajero Sport looks fantastic with its modern and simultaneous new design which gives it an excellent road presence and strong exterior appearance. It has 17 inch alloys shod with grippy wide tires which add to the sports character of the machine. It has well proportionate front to rear passenger front to rear design and well designed rear section. When it comes in interiors, the Pajero Sports has a spacious cabin area with generous room for the front and rear passengers. There is ample leg room and head room even for taller passenger. The driver seat is a multi - adjustable unit and provides excellent lateral support while the rest of the passenger seas are comfortable and offer very good lower back support. Pajero Sports has leather seats, rear sensors, 2 DIN touch screen stereo system with 6 speakers and the air conditioner is excellent at keeping the temperature low inside the cabin. Pajero Sports is powered a 2.5-litre, 2477cc DHOC diesel engine which produces maximum of 175 BHP to 4000 RPM and peak torque of 400 NM between 2000 RPM to 2500 RPM. It is mated to a 5 speed manual transmission gearbox and brings a four wheel drive system. If the excellent low emd performance and has been rated by ARAI to deliver a maximum fuel efficiency of 11 kmpl. It offers the blend of comfort at very good value considering all the features. Mitsubishi Pajero Sport price in Mandi start at Rs. 27.39 Lakh. The lowest price model is Mitsubishi Pajero Sport 4X2 AT and the most priced model of Mitsubishi Pajero Sport 4X4 Dual Tone priced at Rs. 28.29 Lakh. This is a massive change over as compared to older pajero this one pampers you no end. Leather seats,steering and gear knob. There are wooden inserts inside and the red illumination for the switches and console looks terrific at night. At 4695mm long. 1815mm wide and 1840mm, high, the pajero sports fits in between the fortunr as far as size done! On the wheelbase front alao, the endeavor beats the pajero by 60mm.the projector headlamps along with the chrome grills amd huge.